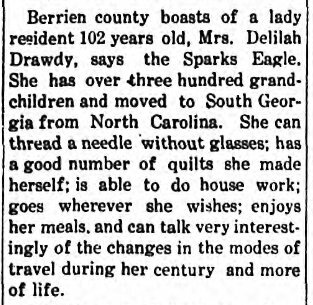 Berrien county boasts of a lady resident 102 years old, Mrs. Delilah Drawdy, says the Sparks Eagle. She has over three hundred grand-children and moved to Georgia from North Carolina. She can thread a needle without glasses; has a good number of quilts she made herself; is able to do house work; goes whereever she wishes; enjoys her meals, and can talk very interestingly of the changes in the modes of travel during her century and more of life. The photo was taken about 1904, the first year the REO Motor Car Company produced automobiles. Dr. Pleasant H. Askew was a prominent physician, businessman and landowner of Nashville, GA. In the 1920s he purchased a farm from Sullivan J. Knight along Cat Creek about five miles north of Ray City, GA; it was one of several Berrien County properties he owned. Died at Age of 102. Adel, March 17. 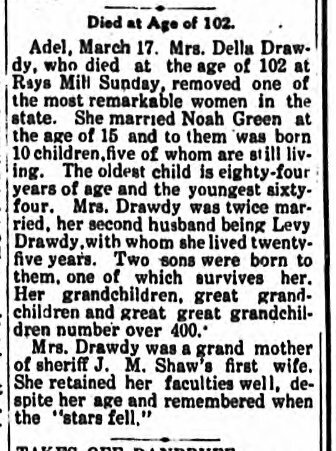 Mrs. Delilah Drawdy, who died at the age of 102 at Rays Mill Sunday, removed one of the most remarkable women in the state. She married Noah Green when she was 15, and to them was born 10 children, five of whom are still living. The oldest child is eighty-four years of age, and the youngest is sixty-four. Mrs. Drawdy was twice married, her second husband being Levy Drawdy, with whom she lived twenty-five years. Two sons were born to them, one of which survives her. Her grand children, great grand children and great great grandchildren number over 400. Mrs. Drawdy, probably the oldest woman in the State of Georgia died at her home in Rays Mill Sunday. She was 102 years old, and was the grandmother of J. H. May and Mrs. J. M. Shaw of Adel…. She was able to sit up and sew until a few weeks before her death , and at the age of 101, she made a quilt for her grandson, J. H. May. Her eyesight and hearing were good and she maintained her metal faculties until the last. She joined the Primitive Baptist Church in 1852. Burial took place at Milltown Monday. She was born in North Carolina and moved to Georgia when she was 15 years old. Surviving children, William Green of Stockton, Mrs. Baten of Sparks, Mrs. D. M. Drawdy of Rays Mill, H. H. Green of Rays Mill, Mrs. H. Cox of Dupont and S. M. Drawdy of Hahira. Affectionately known as “Dillie, her maiden name was Delilah Ann Hinson. She was born on Christmas Day, 1812 in Anson County, North Carolina a daughter of Frances Steward and Charles “King” Hinson. As a young woman she came with her father to Pulaski County, GA. About 1827 she married Noah Green, also of North Carolina. Census records for Noah Green show he and Dillie made their household in Captain Lenam’s District, Pulaski County, GA.
Family tradition says about 1854-55 Noah Green relocated his household to that part of Lowndes county which was soon to be cut into the new county of Berrien. But almost at the moment of arrival at the new homestead, Noah Green suffered a heart attack and died, leaving the widowed Dillie to raise a family on her own. Within a year or two Delilah Hinson Green married again. Her second husband was the widower Levi Drawdy, a prosperous farmer in Berrien County. He was a son of John Drawdy, born October 15, 1803, in the Barnwell District of South Carolina. His uncle Daniel Drawdy was a veteran of the Revolutionary War. Drawdy’s first wife, Rebecca Carter, was a daughter of Elijah Carter, Sr., who lived on Little Saltketcher Creek on the Barnwell-Colleton line in South Carolina. Levi and Rebecca Drawdy made their home in Barnwell county until 1834 when they moved to settle on land on the west side of the Alapaha River in present day Lanier County, GA. Many of the Carter family connection had already come from South Carolina to settle in the same area. On June 7, 1834 Drawdy and his wife Rebecca were baptized into the membership of Union Church. He served as a private in 1838 in the Indian War, in Capt. Jesse Carter’s Company of Lowndes County militia. In 1853, Rebecca Carter Drawdy died and was buried at Union Church near their home. She was survived by her husband and ten children. About 1854, the widower Levi Drawdy and the widow Delilah Ann Hinson Green were married. The couple made a blended household out of their large families. At the time of marriage they had 18 children between the two of them. Their union produced two more. Mr. Drawdy was buried at Union Church. He left a will dated July 25, 1864, which was probated August 25, 1881, in Lowndes Court of Ordinary. His son, Daniel, was designated as executor. His home place and farm, Lot of Land No. 389 in 11th district of Lowndes, was divided among the wife and surviving children: Daniel Drawdy, Levi Drawdy, Jr., Sylvester M. Drawdy, Mrs. Christina Drawdy Wetherington, Mrs. Elizabeth Green Touchston, Mrs. Kiziah Drawdy Rhoden, Mrs. Sarah Drawdy Chitty, and Fairiby Drawdy. Delilah Ann Hinson Green Drawdy died in 1914. She is buried along with other members of the Green and Drawdy families in the cemetery at Union Church.